This year, treat yourself and your loved ones with a visit to Texas’ beautiful Hill Country. We offer some of the most stunning natural beauty in the state, friendly folks, interesting things to do, and some darned good times, no matter what season of the year you choose to come on down. And, although we are pretty stuck on Kerrville, it just wouldn’t be fair not to mention a few other places that we think ya’ll would enjoy visiting. So, whether it’s a short jaunt or a full-on day trip, here are a couple of suggestions for your consideration. First, check out the German-immigrant-settled town of Boerne. Located just 30 miles north of San Antonio, Boerne boasts a combination of German heritage, Texas culture, and beautifully-preserved historic examples of European architecture. Boerne is also home to fine cuisine, art galleries, wine bars, and a myriad of festivals and cultural events. Next, take in the old-world charm of Fredericksburg. Another town with strong German roots, the folks here are proud of their vineyards, their views, and their peaches! 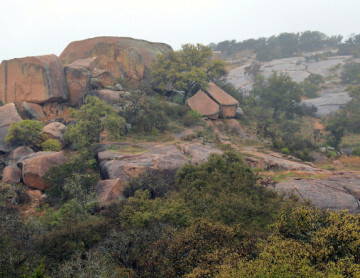 Don’t miss a trip to nearby Enchanted Rock State Natural Area for sightseeing, hiking, and picnics.